Hello everyone! I have decided to start accepting donations for the next fundraiser. Craft for China is an arts & crafts fundraiser for orphans in China. For more information visit the links under the menu title. If you want to donate one of your products to the current fundraiser go here & read all the info. then fill out & submit the form by clicking the button above. Thank You! For Emma & Gracie's protection & privacy DO NOT post their photos & information on your websites/blogs. I encourage you to write about the fundraiser but please do not use Gracie & Emma's photos or information in those posts. Thank You. 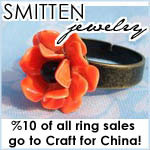 Add Craft For China blog to your bloglines so you never miss an update! advertise here for only $5! interested?